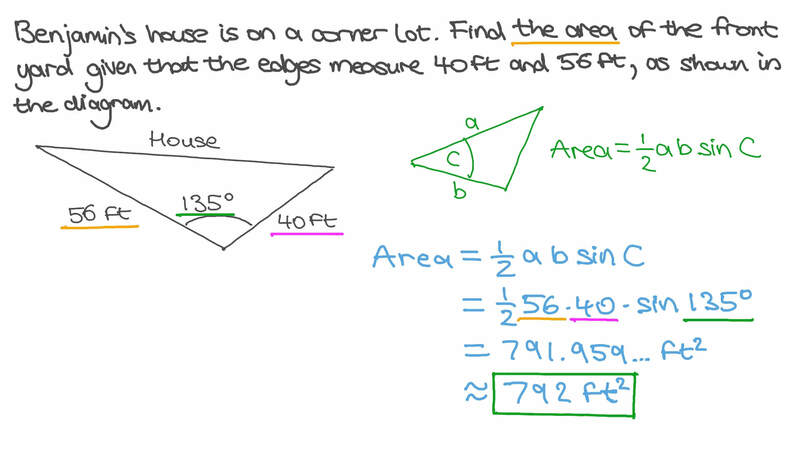 In this lesson, we will learn how to find the area of a triangle without having to calculate its perpendicular height. 𝐴 𝐵 𝐶 is a triangle, where 𝐵 𝐶 = 1 5 c m , 𝐴 𝐶 = 2 5 c m , and 𝑚 ∠ 𝐶 = 4 1 ∘ . Find the area of 𝐴 𝐵 𝐶 , giving your answer to three decimal places. Find the area of the figure below giving the answer to three decimal places. 𝐴 𝐵 𝐶 is a triangle where 𝐴 𝐵 = 5 c m , 𝐴 𝐶 = 1 1 c m , and 𝑚 ∠ 𝐴 = 1 0 7 ∘ . Find the area of the triangle giving the answer to two decimal places. 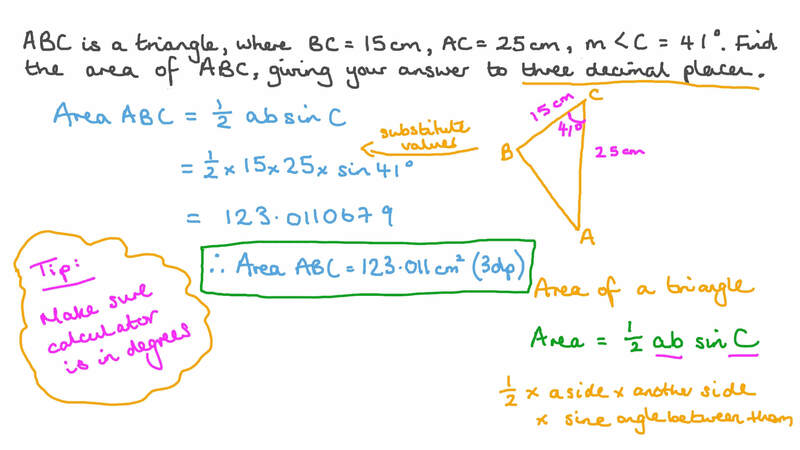 In the given figure, work out the area of the triangle to 2 decimal places. Maged’s house is on a corner lot. Find the area of the front yard given that the edges measure 40 ft and 56 ft, as shown in the diagram. The figure shows a triangular field with sides 670 m, 510 m and 330 m. Find the area of the field giving the answer to the nearest square metre. Which of the following is a formula that can be used to find the area of a triangle? Find the area of a triangle whose two side lengths are 7 cm and 23 cm, and the angle included between them is 1 0 1 ∘ .Give the answer to three decimal places. An isosceles triangle has a side length of 49 cm and a base angle of 4 4 ∘ . Find the area of the triangle giving the answer to three decimal places. 𝐴 𝐵 𝐶 is an isosceles triangle where 𝐴 𝐵 = 𝐴 𝐶 = 1 1 c m and 𝑚 ∠ 𝐴 is 1 5 8 ∘ . Find the area of 𝐴 𝐵 𝐶 giving the answer correct to two decimal places. 𝐴 𝐵 𝐶 is a triangle, where ∠ 𝐴 𝐶 𝐵 is obtuse, 𝑎 = 2 0 c m , 𝑏 = 1 4 c m , and the area is 106 cm2. Find the length of 𝐴 𝐵 , giving the answer to two decimal places. 𝐴 𝐵 𝐶 𝐷 is a parallelogram where 𝐴 𝐵 = 9 . 3 c m , 𝑚 ∠ 𝐶 𝐴 𝐵 = 2 6 4 8 ′ ∘ and 𝑚 ∠ 𝐷 𝐵 𝐴 = 6 6 3 0 ′ ∘ . Find the area giving the answer to two decimal places. 𝐴 𝐵 𝐶 is a triangle where 𝑎 = 2 3 c m , 𝑏 = 2 1 c m , the area is 167 cm2 and the radius of the circumcircle is 17 cm. Find length 𝑐 giving the answer to two decimal places. 𝑋 𝑌 𝑍 is a triangle where 𝑚 ∠ 𝑋 = 3 5 ∘ , 𝑚 ∠ 𝑌 = 6 2 ∘ and the area is 480 cm2. Find the length of 𝑌 𝑍 giving the answer to the nearest centimetre. 𝐴 𝐵 𝐶 is an acute-angled triangle where 𝐴 𝐶 = 3 0 c m , s i n 𝐴 = 0 . 7 and the area is 315 cm2. Find 𝑚 ∠ 𝐵 , giving the answer to the nearest minute. 𝐴 𝐵 𝐶 is a triangle where 𝑎 = 2 4 . 9 c m , 𝑏 = 2 7 . 9 c m , 𝑐 = 2 2 . 5 c m and the radius of the circumcircle is 22.4 cm. Find the area of the triangle giving the answer to one decimal place. 𝐴 𝐵 𝐶 is a triangle where 𝑚 ∠ 𝐴 = 6 4 ∘ , 𝑚 ∠ 𝐶 = 7 1 ∘ and the perimeter is 59.34 cm. Find the area of the triangle giving the answer to two decimal places. 𝐴 𝐵 𝐶 is a triangle where 𝑚 ∠ 𝐴 = 4 7 ∘ , 𝑚 ∠ 𝐵 = 6 6 ∘ and the area is 197 cm2. Find the perimeter of 𝐴 𝐵 𝐶 and the circumference of the circumcircle giving the answer to two decimal places. A perimeter is 64.96 cm and circumference is 79.5 cm. B perimeter is 41.65 cm and circumference is 79.5 cm. C perimeter is 41.65 cm and circumference is 39.75 cm. D perimeter is 64.96 cm and circumference is 39.75 cm. Given that 𝐴 𝐵 𝐶 is a triangle where 𝑚 ∠ 𝐵 = 6 8 ∘ and 𝑚 ∠ 𝐶 = 4 0 ∘ . The point 𝐷 lies on 𝐵 𝐶 where 𝐴 𝐷 = 2 6 c m and bisects ∠ 𝐴 . Find the area of △ 𝐴 𝐵 𝐶 giving the answer to two decimal places. The area of the triangle 𝐴 𝐵 𝐶 is 𝑥 and the radius of the circumcircle is 𝑟 . Find the value of 4 𝑟 𝑥 𝑎 𝑏 𝑐 .
𝐴 𝐵 𝐶 is a triangle where 𝑚 ∠ 𝐵 = 6 6 ∘ , 𝑚 ∠ 𝐶 = 6 3 ∘ and the diameter of the circumcircle is 27 cm. 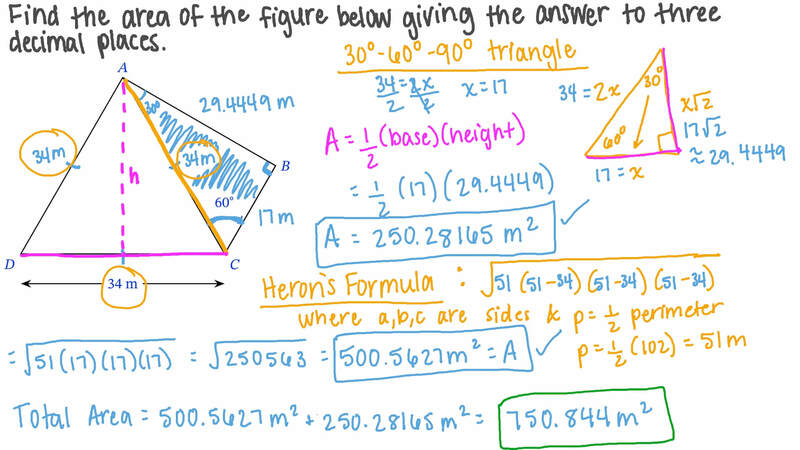 Find the area of the triangle 𝐴 𝐵 𝐶 giving the answer to two decimal places. 𝐴 𝐵 𝐶 is a triangle where 𝑚 ∠ 𝐵 = 3 6 ∘ , 𝑚 ∠ 𝐶 = 6 0 ∘ and the area of 𝐴 𝐵 𝐶 is 153 cm2. Find 𝑎 giving the answer to two decimal places. 𝐴 𝐵 𝐶 is an isosceles triangle where 𝑏 = 𝑐 , 𝑚 ∠ 𝐴 = 4 2 ∘ and the perimeter is 31.31 cm. Find the area of the triangle giving the answer to two decimal places. Find an expression for the height ℎ in terms of 𝑎 , 𝑏 , and 𝐶 . Find an expression for the area of the triangle in terms of 𝑎 , 𝑏 , and 𝐶 . The Bermuda triangle is a region of the Atlantic Ocean whose boundary is made up of straight lines connecting Bermuda, Florida, and Puerto Rico. Given that Florida is 1 0 3 0 miles from Bermuda in the direction 24 degrees south of west and Puerto Rico is 980 miles from Bermuda in the direction 4 degrees west of south, find the area of the Bermuda triangle.